Diamond K has a wonderful facility. It inlcudes 18 stalls, lighted indoor arena, outdoor arena, round pen, and trails. See what else we have to offer for your equine if you decide to board with us. Our goal is to provide each student with a safe and relaxed teaching environment regardless of discipline. 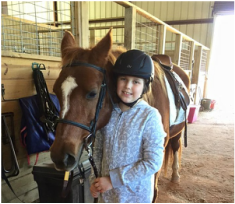 Diamond K Stables is a place where children and adults can progress at their own pace and enjoy the bonds that develop between themselves and the horses. Diamond K is a beautiful place where wonderful events such as camps, clinics, and parties are available year around. Check out what you can plan or attend during the year.